Congress has just unveiled a sweeping democracy reform bill that will make elections fairer and put power back in the hands of the American people. 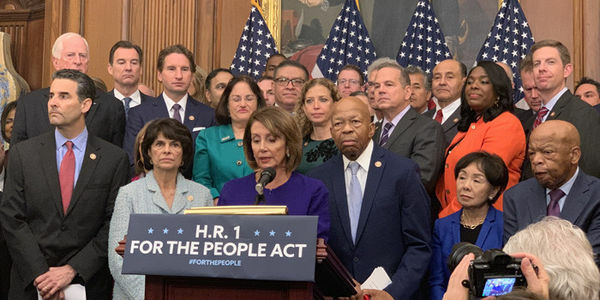 HR1, the For the People Act, is a roadmap to solve the problems facing our Democracy. HR1 will protect voting rights with reforms like modernizing and updating the Voting Rights Act, passing automatic voter registration and same-day registration, and establishing strong redistricting guidelines to combat voter suppression. During the 2018 midterm elections voters faced a litany of issues. In many states voters waited hours to cast their ballot — in Georgia many stood in line up to 5 hours. At polling stations across the country, voting machines were not working and eligible voters were showing up only to find that they had been purged from the roll. Elections should be free, fair, and accessible to all eligible voters — but our current system is anything but ideal. Luckily, the incoming Congress has the power — and a plan — to reform our elections. Tell Congress to support HR1 to make our elections fairer and put the power back in the hands of the American people! You have the power to influence this reform, and it will take all of us, working together, to speak out and demand change.